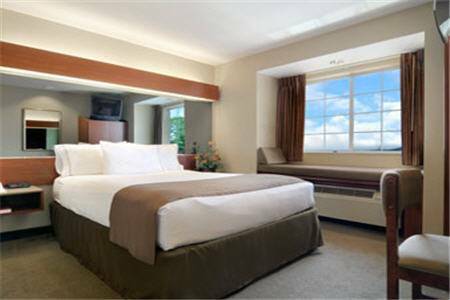 Relax at the consistently enjoyable Microtel Inn and Suites Daphne/Mobile hotel conveniently located off Interstate 10 near the USS Alabama, golf courses, downtown Mobile and the Alabama Cruise Terminal at Mobile Bay. Enjoy seafood and a view of the bay at The Complete Angler restaurant just up the road. Ideal for business and leisure, enjoy an affordable price for modern amenities including complimentary wireless Internet access, complimentary continental breakfast, guest laundry facilities, complimentary large-vehicle parking, meeting and banquet room with audio/visual equipment, and business center with copy, fax and printing services. Guest room amenities include coffee-maker, hairdryer, desk and TV. Suites, smoke-free and handicapped-accessible rooms are also available. There is no charge for children 17 and under with an adult.